Eagle Ford-focused Aurora Oil & Gas, which will soon be absorbed by Baytex Energy, had first quarter estimated gross production of 28,600 (21,100 net) boe/d. 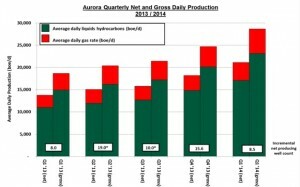 That's a 54% increase over the first quarter of 2013, and a 16% increase over Aurora's fourth quarter production in the play. In February of 2014, Baytex Energy agreed to purchase Aurora for $2.6 billion. When the deal closes, it will include 22,000 net contiguous acres in the Sugarkane Field. The acreage is located in what is commonly referred to as the "sweet spot" or oil window of the Eagle Ford Shale. During the first quarter, 32 gross new Eagle Ford wells (8.6 net) were put into production for a total of 419 gross producing wells (111.7 net). A total of 57 gross new wells (15 net) were spudded during the first quarter of 2014, and at the end of the quarter, drilling operations continued on 10 wells, while 29 wells were awaiting fracture stimulation. Aurora's net acreage covers Karnes, Live Oak and Atascosa counties. Revenue from oil and gas sales in the first quarter was $182 million.